The inaugural $10,000 Dealers Choice event at the 2015 World Series of Poker drew a modest field of 108 players, creating a total prize pool of $1,015,200. Given the size of the buy-in and the skill level required to play in the tournament, it’s no surprise that the list of those who made the money is a who’s who of the best players in poker today. 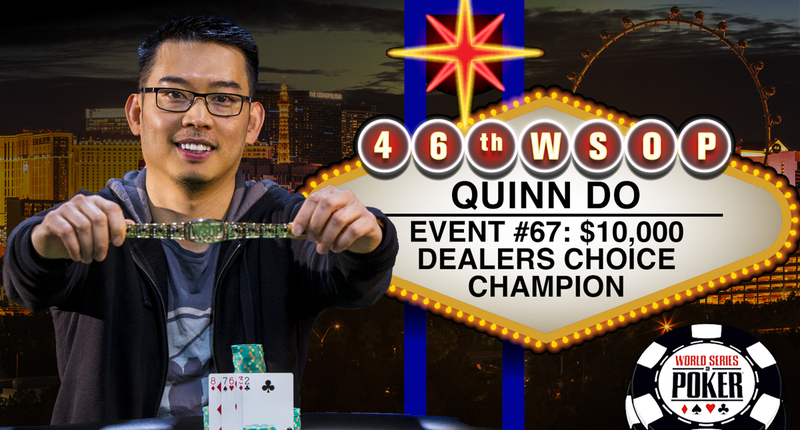 In the end, it was 39-year-old Los Angeles-based poker pro Quinn Do who came away with the title, along with his second career bracelet and the $319,792 first-place prize. Do’s first bracelet came at the 2005 WSOP, when he won a $2,500 limit hold’em event. He now has just under $2.5 million in career tournament earnings. The official final table of six featured four bracelet winners, including Do. Adam Friedman (5th), Jeff Madsen (3rd) and Rep Porter (2nd) had all previously won WSOP tournaments. Other notables who finished in the money included Ray Dehkharghani (11th), David Chiu (9th), Paul Volpe (8th) and David Benyamine (7th).